Dr. Brophy's clinical interests include; Neonatal and congenital genetic renal anomalies, Acute Kidney Injury/Critical Care Nephrology, Lifecourse healthcare delivery, Healthcare Delivery Sciences as well as Technology use in improving healthcare access and reducing disparity. 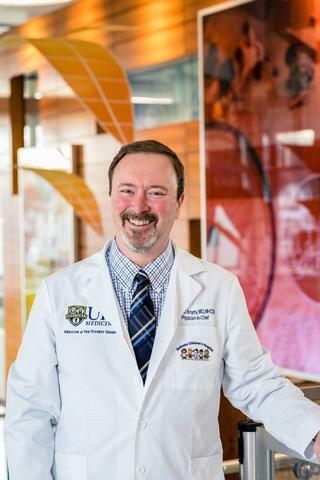 Dr. Brophy serves as the President-elect of the American Society of Pediatric Nephrology (ASPN); Member of the American Board Pediatrics (ABP). Is a member of the Association of Medicine School Pediatric Department Chairs (AMSPDC) and serves on the finance committee of the American Board of Medical Specialties (ABMS) and on the program planning committee for the Society for Pediatric Research (SPR). Dr. Brophy has experience in basic, translational, clinical healthcare delivery research and has been part of the leadership team for the Integrated Special Populations component of the University of Iowa's CTSA and was part of the lifecourse research group at the CC-CHOC prior to its dissolution by the NIH. As an extension of improving clinical care access in the state of Iowa, he founded the Signal Center for Health Innovation and has developed a telehealth portfolio that can be used for teaching and research as well (www.thesignalcenter.com). From a clinical research perspective he has had a strong track record of research collaboration with the ppCRRT and ppAKI consortia, which has resulted in multiple peer reviewed publications and significantly impacted on care management of patients requiring acute dialysis and those with Acute Kidney Injury (AKI). Dr. Brophy's basic sciences laboratory and research focuses on the molecular genetics and functional mechanisms of normal and abnormal development of the kidneys and genitourinary (GU) tract. His genetics lab utilizes predominantly murine animal models for this work. He also has a translational interest in the field of metabolomics of neonatal acute kidney injury and is a part of an international collaborative group- The AWAKEN group. He established a collaborative group using metabolomics in the investigation of neonatal (premature infant) AKI and has also partnered with several other well-known Pediatric investigators in the area of the proteomics of Neonatal AKI as a Co-Investigator in the Recombinant Erythropoietin for Protection of Infant Renal Disease (REPaIReD) trial. As a result of his long standing work in the area of renal development related to this work, he initiated and developed a collaborative genetics network (www.kidneygenes.com) in the area of renal agenesis which is a condition well known to the Pediatric Nephrology community and developmental biology community. Elected to the "Society for Pediatric Research"
Resident Research Foundation Award- for "The Expression of RHAMM and Alpha-Smooth Muscle Actin in Glomerulonephritis"
Selewski DT, Akcan-Arikan A, Bonachea EM, Gist KM, Goldstein SL, Hanna M, Joseph C, Mahan JD, Nada A, Nathan AT, Reidy K, Staples A, Wintermark P, Boohaker LJ, Griffin R, Askenazi DJ, Guillet R, . "The impact of fluid balance on outcomes in critically ill near-term/term neonates: a report from the AWAKEN study group." Pediatric research.. 2018 Sep 20; Epub 2018 Sep 20. Starr MC, Askenazi DJ, Goldstein SL, MacDonald JW, Bammler TK, Afsharinejad Z, D Brophy P, Juul SE, Mayock DE, Hingorani SR. "Impact of processing methods on urinary biomarkers analysis in neonates." Pediatric nephrology : journal of the International Pediatric Nephrology Association.. 2018 Jan 0; 33(1):181-186. Epub 2017 Aug 19. Mink R, Schwartz A, Carraccio C, High P, Dammann C, McGann KA, Kesselheim J, Herman B, . "Creating the Subspecialty Pediatrics Investigator Network." The Journal of pediatrics.. 2018 Jan 0; 192:3-4.e2.